Ash Vs. Evil Dead has completed its second season on Starz to rave reviews. Kyle Willoughby and Claire White are ready to talk about the show’s special mix of gore, comedy, and touch of cosmic horror. Kyle begins with the history of the world’s most infamous book, The Necronomicon. He then works his way to H.P. Lovecraft and the many his pieces inspired. 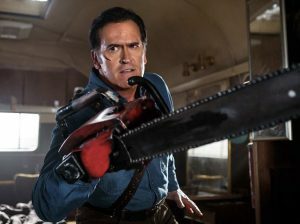 Claire makes the jump to the 1970s when Sam Raimi, Rob Tapert, and Bruce Campbell began what would we be a decades long collaboration, and explains why Starz was happy to have them now. Our hosts end with their thoughts on the franchise, the quality of its performances, and the show’s unique place in television.